This nutritious and delicious soup is a perfect way to start a meal. The combination of parsnip and pear gives this soup, a nice and rustic flavor. The good thing about this soup is that you can either make a lighter version or can go for a rich and creamy version of the same. If pear is not available, you can go for kiwi or pineapple. One can use chicken broth or vegetable broth (for the soup base) as per the preferences. The seasoning of this soup is mild which can be adjusted as per your taste. Make this soup in a limited quantity as the refrigerated version doesn't taste that good. Feel free to use your preferred garnish. Let's get started and quickly make this appetizing and easy-to-make parsnip soup for everyone. 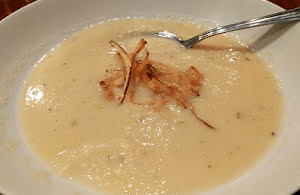 Savor this delicious, appetizing, and irresistible soup preparation consisting of parsnips and pears which are cooked delicately in a flavorful broth base. Heat olive oil in a large sauce pan on a medium flame. Add finely chopped garlic and stir fry for a minute. Add chopped parsnips and gently stir for a minute. Add vegetable stock and bring it to a boil. Lower the flame and simmer for about 5 minutes with a covered lid. Add pears and season with nutmeg powder, onion powder, freshly ground black pepper, and salt. Cover the pan once again with the lid and simmer for another 5 minutes. Let it cool down a bit and blend in a food processor until smooth. Return back the blended soup to the pan and add unsalted butter. Simmer for about a minute or two. Garnish with roasted parsnip juliennes and serve hot.